Multiple benefits will be on offer to attendees at next week’s conference on Sustainable Turfgrass Management in Asia. Held under the auspices of the Thai Golf Course Superintendents’ Association (TGCSA), the conference is part of a three-day gathering that also includes an Asian Golf Industry Federation (AGIF) Turfgrass Management Exposition. 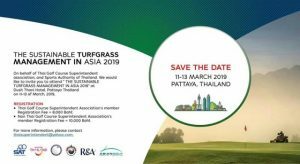 Golf course superintendents and club managers from Thailand and around the region will descend on the Central Thai beach resort where a series of high-profile speakers will focus their attention on sustainable golf. Meanwhile, not only will delegates stand to gain educational points, but also they’ll have the chance to win a fully-paid trip to Singapore to participate in next year’s SMBC Singapore Open Volunteer programme. As well as 16.5 Chapter Education Points being given by the Club Management Association of America, the Golf Course Superintendents Association of America is offering 1.4 Educations Points. Courtesy of Sentosa Golf Club and the Asian Golf Industry Federation, there is further incentive for attendees who work at a golf club. To be eligible to enter the lucky draw – with the top prize of the Singapore trip – delegates must prove their attendance at all sessions of the Sustainable Turfgrass Management in Asia conference by obtaining stamp confirmation after each session from the appropriate AGIF officer. The lucky draw winner will be announced during the final afternoon on Wednesday (March 13). Following an opening address from the organisers on Tuesday (March 12), Wendy Cole, Manager, Sustainability at The R&A, will take to the conference stage with a general introduction entitled Golf Around the World. Either side of a networking lunch will be presentations from Thai ‘Tony’ Patsakorn Tirawan, a 30-year veteran of golf course construction and maintenance around Asia who is now Course Superintendent at Singapore Island Country Club, and Brian Curley, Principal at Schmidt-Curley Golf Design. Curley will then join a panel discussion on Renovation and Sustainability alongside The R&A’s Cole, Chris Gray, Director of Golf Course Maintenance at Singapore Island Country Club, Dr Mike Richardson, from the Department of Horticulture at the University of Arkansas, and Ralph Kepple, Course Superintendent at Atlanta’s East Lake Golf Club, host to 18 PGA Tour Championships. Gray, Kepple and Richardson will all return for further final-day presentations.